Cinnamon Sugar Grilled Peaches are for those who don’t feel like baking. Simply grill the cinnamon sugar coated peaches and serve with ice cream. You will be amazed with the taste when you have the first bite! Ready in 10 minutes! If you are looking for an easy and simple dessert that doesn’t require a lot of ingredients, this Cinnamon Sugar Grilled Peaches recipe is what you need. 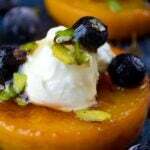 I serve it with vanilla ice cream but you can top the grilled peaches with Greek yogurt too to make it healthier. But sometimes we need to spoil ourselves with such not-very-guilty desserts. If you have time for chilling, you will probably want to check our No-Bake Peach Cheesecake, which you can serve in individual portions jars. 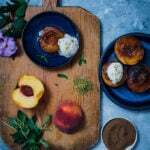 These cinnamon sugar grilled peaches have a subtle buttery flavour, which ends up with a lovely balance with cinnamon. So I don’t recommend oil if you love buttery pies or cakes. If you want to have a lighter taste or lower the calories, you can use a neutral tasting oil instead or just leave it out. Grill is not a must for this recipe, you can use a grill pan on your stovetop just like I did in the video. BTW did you see the video we prepared for this cinnamon sugar grilled peaches recipe? I’d love to thank my husband for being so patient about me when recording. I just felt so excited during the video shooting and made so several mistakes. Don’t forget to subscribe our youtube channel to see more videos soon. Peach is one of my favourite fruit and I love to try recipes with it. I think it is a great dessert on its own, so it doesn’t need a lot of work for an elegant dessert. A perfect ending to your BBQ party is -with no question grilled fruit. Either topped with Greek yogurt or ice cream, grilled fruit is our number one choice for a super quick dessert. If you haven’t tried grilled fruit yet, you’re missing a lot. Try it at your next BBQ party! Grilled pineapple, peach, apricot and plum are on top of our list. Simply grill the cinnamon sugar coated peaches and serve with ice cream. Heat a grill pan over medium low heat. Melt butter in it and coat the bottom very well with it using a brush. In a small bowl, combine brown sugar and cinnamon. Coat the cut side of peaches with this mixture and directly place them cut side down in the pan. Cook them for 4-5 minutes and then turn them over. Cook for another 3 minutes or until soft. 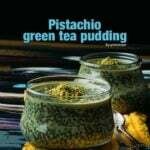 Serve warm with a dollop of ice cream and garnish with mint leaves and pistachio. This ice cream and that video!!! I am a HUGE fan.